A successful bloom period is critical for determining a strong yield and healthy almond crop. Ensuring success requires many factors, none which is more important than the honey bee. Almond growers and beekeepers are responsible for creating an environment that allows pollinator honey bees to do what almond trees need most — pollinate. All those responsible for pollination and pest management during bloom should establish a clear communication chain amongst each other, as each person in the chain plays an important role with specific responsibilities that include making sure that the right information is shared at the right time with the right person. As part of an ongoing commitment to honey bee health, the Almond Board of California developed a comprehensive set of Honey Bee Best Management Practices (BMPs) for California’s almond industry. Developed with input from the almond community, beekeepers, researchers, UC Davis, California and U.S. regulators, and chemical registrants, the Honey Bee BMPs represent the Almond Board’s most extensive educational documents to date to ensure that almond orchards remain a safe and healthy place for honey bees. 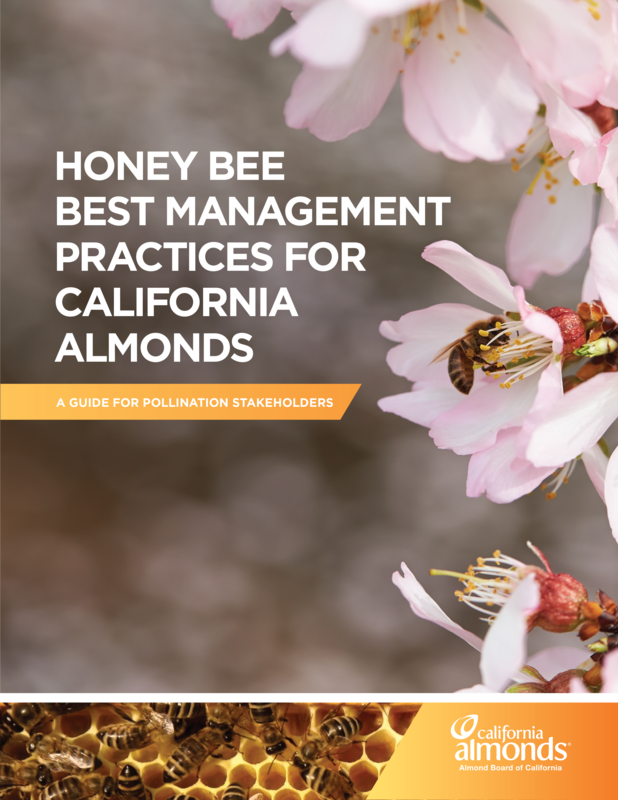 This resource lays out simple, practical steps that almond growers, together with beekeepers and other pollination stakeholders, can take to protect and promote bee health on in and around their orchards, and in their surrounding community. Research shows that forage does not compete with almond blooms and indicates a trend toward increased colony strength in the presence of supplemental forage. Although planting forage may not be suitable for all growers, it can provide a number of benefits where orchard conditions are favorable. The updated Honey Bee BMPs now include information on the benefits of planting forage on; see pages 16-17. A new addition to the Honey Bee BMPs is the Bee Where program, an improved registration and reporting system that keeps growers, beekeepers, PCAs and applicators better connected and allows all parties to view hive locations in real-time. Check out this program today at BeeWhereCalifornia.com. The Almond Board of California provides an Almond Pollination Directory — a searchable database of beekeepers that almond growers can use to locate beekeepers and their pollinators. Beekeepers are also invited to submit their contact information to be included in the directory.